Celebrate winter Lake Tahoe style, when other places are slowing down the Lake Tahoe ski resort communities are just getting started! Northstar California is a dream destination for snowsport enthusiasts, featuring world-class ski slopes, an epic terrain park for snowboarders, ice skating, and 90+ ski trails. Northstar Village is located at the base of the mountain with a unique selection of high-end shops and boutiques, refined and casual dining, and a plethora of activities and events. Relax in true luxury and reserve a room at the Ritz-Carlton located right in Northstar, or other fine lodging choices with direct access to ski lifts. Martis Camp also offers direct access, via the Martis Camp Express ski connection, to the Northstar-ski area. Only those lucky enough to own a piece of Lake Tahoe ski resort real estate at Northstar can truly experience all there is to see and do throughout the year. Northstar homes for sale range from $600,000 to $9,000,000, while Northstar ski condos for sale tend to range from $300,000 to $3,000,000. Considering all it has to offer, it’s no surprise that Northstar is one of the most popular Lake Tahoe ski resort communities around! Squaw Valley helped define ski culture when it hosted the 1960s Winter Olympics, and today it’s one of the premier Lake Tahoe ski resort communities. Relax in luxury at the Village at Squaw Valley, just steps away from a direct access resort gondola. World-class lodging and all the amenities you’d expect (and so much more) are available, with gorgeous million dollar homes throughout the Olympic Valley community. Single-family homes start around $500,000 with the most luxurious estates reaching $5,000,000+. 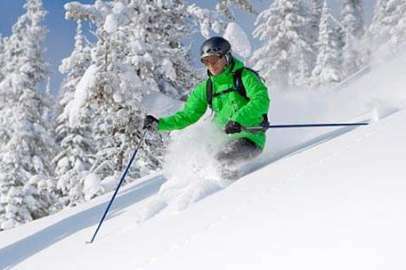 Squaw Valley condos offer equally amazing locales at more affordable prices, ranging from $150,000 to the low millions. The serenity of Alpine Meadows sets it apart from its neighbor Squaw Valley, it’s one of the quieter Lake Tahoe ski resort communities to choose from. Featuring more secluded neighborhoods, these cabins and designer homes make for some of the most peaceful Lake Tahoe ski resort real estate available. If you dream of waking up to breathtaking mountain views every morning, then search homes for sale in Alpine Meadows and start viewing unique homes which range from $450,000 to $2,000,000. Newer homes and luxury Lake Tahoe ski resort real estate can be found in Tahoe Donner, located just minutes from downtown Truckee. Tahoe Donner was originally developed by Jack Kirby as a family resort that would have every recreational facility a family could want, all in one place. Enjoy the Trout Creek Recreation Center with Fitness Facilities, Swimming Pools, Hot Tubs, Steam Rooms & more, 14 Court Tennis Center, Cross Country & Alpine Skiing, 18 Hole Championship Golf Course & private Donner Lake access where there is also a Boat Ramp. There is 60 miles of trails for hikers and bikers to enjoy the epic outdoors. Tahoe Donner is a true Recreational Paradise. This growing community has a huge variety of Tahoe Donner resort homes for sale available so come discover the very popular Tahoe Donner community. Homewood is one of the smaller Lake Tahoe ski resort communities, but offers a lot in the way of Lake Tahoe charm. Homewood Resort features trails, slopes for skiers and snowboarders, lakefront dining and lodging. Enjoy back country skiing with Homewoods Snowcat Adventures. With access to over 750 acres, you can enjoy laps of up to 1.828 vertical feet from the top of Ellis Peak ending at the base of the resort. Homewood has plans to redevelop in the future with a small Village featuring shops, a grocery store, a 5 star hotel and a new mid mountain Lodge with a swimming pool to name just a few. There will be new residential development with both condominiums and ski, ski out chalets. Once done the lifestyle and values of West Shore real estate is bound to have a positive impact. Whether you’re looking for a luxury home, or prefer a natural cabin atmosphere, you’ll find Lake Tahoe ski resort real estate that fits your lifestyle. Start searching for Lake Tahoe ski condos for sale or Lake Tahoe ski resort homes for sale today.